AWC Industries presents to you the Wire Forming Picture of the Week – 4 Hook Wire Rack. The beaded tube bend is done with CNC Wire Bending and can be fabricated up to 1 inch in diameter. At AWC Industries we provide wire bending of ferrous and non-ferrous materials such as steel, stainless steel, aluminum, copper and brass. Utilizing only the finest CNC Forming equipment, we are capable of handling high volume production runs, but can also handle small orders. 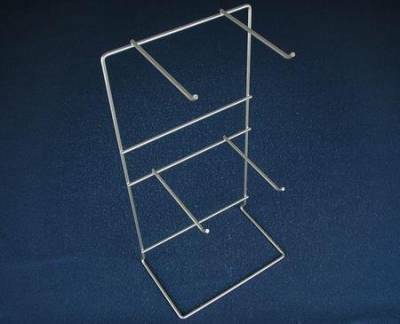 Some of our typical products include push handles, counter top display racks, decorative wire forms, grids and wire grills. Contact us today for a Wire Forming Quote today.